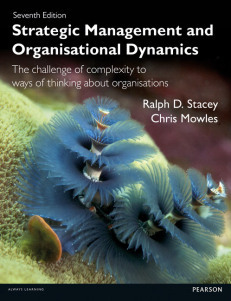 Taking complexity seriously – what difference does it make in organisations? A familiar question from many managers who respond to our presentations on the relevance of insights from the complexity sciences to people organizing, is to ask what their practical application could possibly be. If they consider step-wise prescriptions for success to be ‘concrete’, or are looking for tools and techniques, then the injunction to take every day experience seriously may sound quite ephemeral. If the focus in strategic management is on the ‘big picture’ and wholesale change, then the recommendation to pay attention to how the ‘whole’ emerges in everyday interaction sounds very surprising. However, with some managers what we describe strikes a chord. Additionally, the overwhelming majority of 60-plus graduates of the Doctor of Management programme have found the experience of paying attention to their practice with others transformative, both for themselves and for the organisations in which they work. Every year participants in annual Complexity and Management conference, who come from a variety of organisational backgrounds, bring many examples of how taking the everyday complexity of organizational life seriously makes a difference to expanding possibilities for action. This experience is matched by an increased focus in the scholarly literature on everyday processes of organizing. In this year’s conference we will discuss the complexity of practice and the difference it makes to pay attention to what we are all doing together to get things done. Professor Karen Norman of Kingston University and doctoral supervisor on the Doctor of Management programme. Karen was formally Chief Nursing Officer in Gibraltar and Director of Nursing for Brighton and Sussex University Hospitals NHS Trust (BSUH). She is also a graduate of the DMan programme and continues to take an interest in drawing on insights from complexity theory to inform clinical practice aimed at improving the experience of health care for patients. Henry, Karen and Mark will talk about their collaborative research project on reducing patient falls. Pernille Thorup – Pernille is on the senior management team of COK (Center for Offentlig Kompetenceudvikling), which is the strategic partner in public sector development for KL (Kommunernes Landsforening), the organization of Danish Municipalities. She has recently undertaken a three year strategy process within the company, drawing on insights from the complexity sciences, which has now involved COK’s clients. The changes in her own organisation and the discussion this has provoked in Denmark more widely, will form the subject of her talk. A booking page on the university website will be uploaded in the New Year. This entry was posted in complex responsive processes, complexity, emergence, everyday politics, leadership, management, organisations, research, Uncategorized and tagged CMC, complex responsive processes, Complexity and Management Conference 2016, taking complexity seriously, University of Hertfordshire on November 27, 2015 by Chris Mowles. New edition published this month: the revised, refreshed and updated version of Ralph’s textbook including sections on process organisation studies, new organisational examples, a bit more theory and more up-to-date references. This entry was posted in complex responsive processes, complexity, management, organisations, strategy and tagged Chris Mowles, complex responsive processes, complexity, management, organisational dynamics, Ralph Stacey, strategy on September 23, 2015 by Chris Mowles.